Prosecutors have begun to present a grand jury with evidence against Stoneman Douglas shooting suspect Nikolas Cruz. NBC 6's Willard Shepard reports. Florida prosecutors are expected to begin presenting a grand jury with evidence against a 19-year-old accused of killing 17 people inside a Parkland high school. The South Florida Sun Sentinel reports that the panel, which meets behind closed doors, is expected to begin considering formal charges against Nikolas Cruz on Tuesday. He's been jailed since the Feb. 14 school shooting at Marjory Stoneman Douglas High School, where he was once a student. 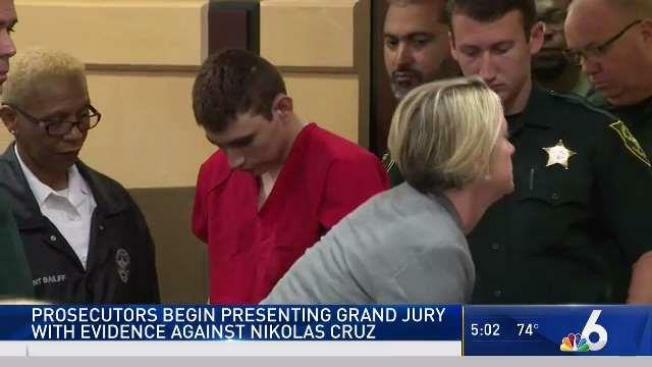 Cruz confessed to investigators when he was captured about an hour after the shooting. Multiple witnesses have identified him as the shooter. The family attorney for Cruz said Cruz's family members are expected to testify before the grand jury on Wednesday. The Broward State Attorney's Office typically presents evidence to grand jurors in all first-degree murder cases and all police shootings. The panel will hear testimony from witnesses and then vote on an indictment, which could take more than one day. Monday, the Florida Senate passed a school safety bill that would place new restrictions on rifle sales, allow some teachers to carry guns in schools and create new school mental health programs. The Senate voted 20-18 for the bill. Few, if any, senators were completely happy with the legislation. Many Republicans don't like the idea of raising the minimum age to buy rifles from 18 to 21 or creating a waiting period to purchase the weapons. Many Democrats think the bill didn't go far enough because it doesn't include a ban on assault-style rifles or large-capacity magazines. The Florida House of Representatives has not yet taken up its version of the bill.